Boxing and weight lifting are similar in that both are workout regimens strongly associated with "macho" attitudes. However, the similarities stop right about at that point. Both use different training methods, schedules and exercises to achieve different fitness goals. In terms of fat loss, which is best depends on how those methods affect your body. Boxing as a sport means training to prepare yourself for a fight in the ring. 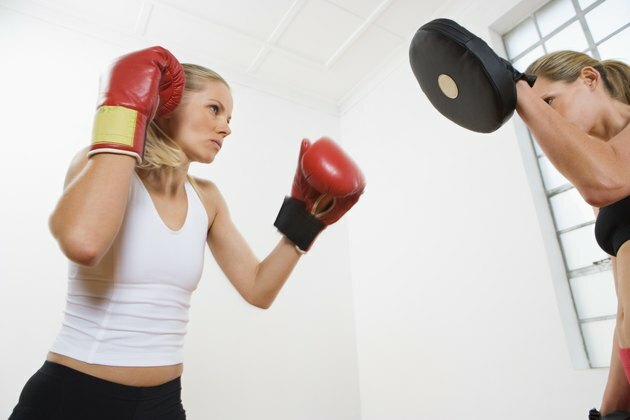 However, many boxing practitioners simply attend class for the fitness and self-defense benefits of the training. 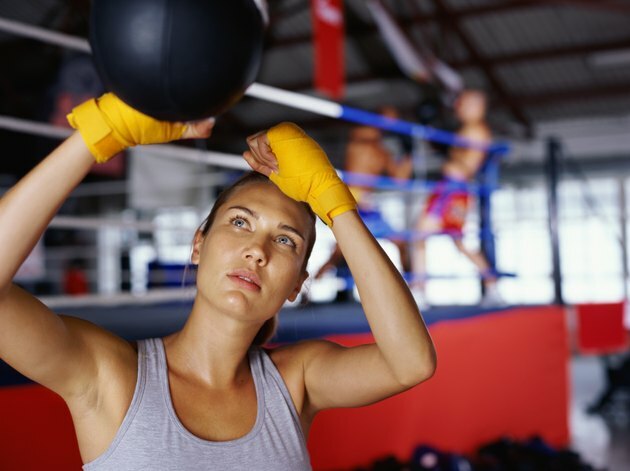 A typical boxing session lasts about one hour, split between sparring, practice drills, resistance training and light activity like stretching or receiving instruction. Hobby boxers typically attend class two or three times per week, while competitive fighters train five or six times. Weight lifting is all about strength, though body builders may also be concerned about appearance aspects such as size or definition. In a session of weight lifting, an athlete will go through a progression of exercises where he lifts heavy weights to develop his strength and endurance. Sessions may work through the whole body, or they might focus on a single area such as the legs or arms. Weight lifting programs might consist of two to three general sessions or four or five specialized workouts. You burn fat when you achieve a state of negative calorie imbalance. If you burn more calories than you eat, your body has to get the excess energy from somewhere. It gets it by burning calories it stored earlier as fat. 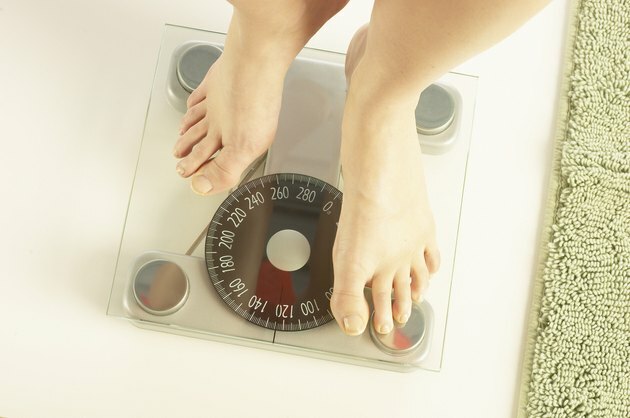 When it accesses that fat energy, you burn fat and lose weight. From an exercise standpoint, how many calories a workout burns is the most important factor when it comes to losing body fat. According to health resource website NutriStrategy, a 155-pound person will burn between 200 and 500 calories per hour of weight lifting, depending on how vigorous he makes his workouts. 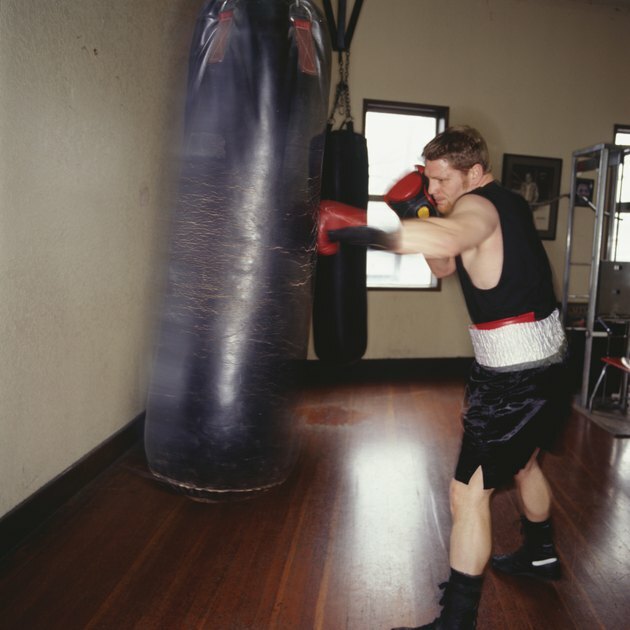 A session of boxing training, assuming equal parts of the various activities involved, will burn about 500 to 600. By this standard, boxing training is better from a fat loss standpoint than training with weights. Will Boxing Get You Ripped? What are the Benefits of Tae Bo? Is Boxing a Good Body Workout?